Responding to threat of sanctions, Iranian FM Zarif hints European countries didn't read nuclear deal, claims deal allowed enrichment. 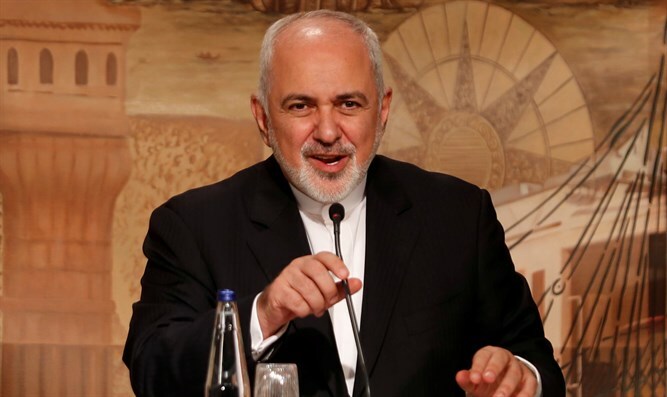 Iranian Foreign Minister Mohammad Javad Zarif on Monday morning emphasized that the "Iran deal," also known as the Joint Comprehensive Plan of Action (JCPOA) did not forbid the enrichment of uranium. "Reminder to our E3 partners in #JCPOA: There is NO prohibition on the enrichment of uranium by Iran under #NPT, JCPOA or UNSCR 2231. Neither now, nor in 2025 or beyond. Might be useful for European partners to actually read the document they signed on to, and pledged to defend," he tweeted. On Saturday, France's Ambassador to the United States Gérard Araud, said on Twitter: "It’s false to say that at the expiration of the JCPOA (the nuclear deal), Iran will be allowed to enrich uranium." He added that "sanctions could be reimposed." In January, Ali Akbar Salehi, the head of the Atomic Energy Organization of Iran, said that the 2015 agreement had required Iran to destroy the Arak reactor's calandria by filling it with cement, but Iran had secretly acquired replacement tubes ahead of time so that the reactor's functionality would not be ultimately affected. Last year, Israeli Prime Minister Binyamin Netanyahu revealed intelligence proving that Iranian officials had lied "big time" when they denied the existence of their country's nuclear program.